The nominees for best documentary feature at this year's Academy Awards include "Hale County This Morning, This Evening," "Minding the Gap," "Of Fathers and Sons" and "RBG" — and one film that had audiences around the country sweating buckets: "Free Solo." The National Geographic documentary follows climber Alex Honnold in his quest to become the first person to "free solo" Yosemite National Park's famed, 3,000-foot rock wall El Capitan, climbing it without any ropes to catch him if he fell. The stakes were high: climb perfectly, or die. "I certainly was trying to avoid that," says Honnold, who had long dreamed of achieving the feat and spent years in the run-up carefully calibrating the climb's every move. "But even more so, I was just trying to do my due diligence to some extent: The crew is putting so much effort into crafting a great film. And so I was trying to do my share. I was trying to make sure that I put the [same] amount of effort as well." Filmmakers Jimmy Chin and Elizabeth Chai Vasarhelyi captured Honnold's successful attempt, along with a team of expert cameramen climbers. Chin tells Here & Now's Robin Young he woke up every morning thinking about the unthinkable: watching his friend fall through the camera frame to his death. "That sounds really morbid, but I mean it also is a useful tool to make sure that that doesn't happen," says Chin, who faced potentially putting Honnold's life at risk by dropping something as small as a lens cap. 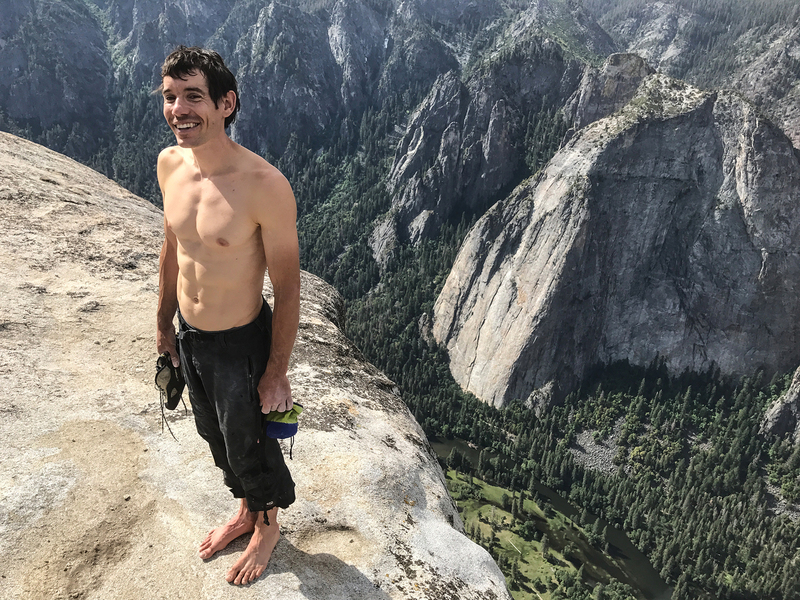 Although questions about fearing for his life are natural, Honnold says it can be easy for them to overshadow why he free solos in the first place. "It does feel quite beautiful, and I think that at the heart, I've always loved the movement of climbing, and free soloing is in some ways the purest way that you can rock climb," he says. "And so I spend a lot of time talking about the consequences ... but I think actually the joy of it is why I free solo." Jimmy Chin: "I think the main question for us was whether or not us being there filming him would make it more dangerous or more likely for him to fall. "That was one of the central questions that Chai and I had to answer for ourselves, was whether or not we trusted Alex's decision-making process, and how he would approach the climb and whether or not the external pressure of a production would push him to do something that he wouldn't normally do. Being that the climbing is very tenuous — I mean, if you knocked off a pebble even, it could actually fall 200 feet and hit him just at the wrong moment — there were a lot of different scenarios that we thought about and tried to kind of imagine all the different outcomes in order to mitigate the risks. 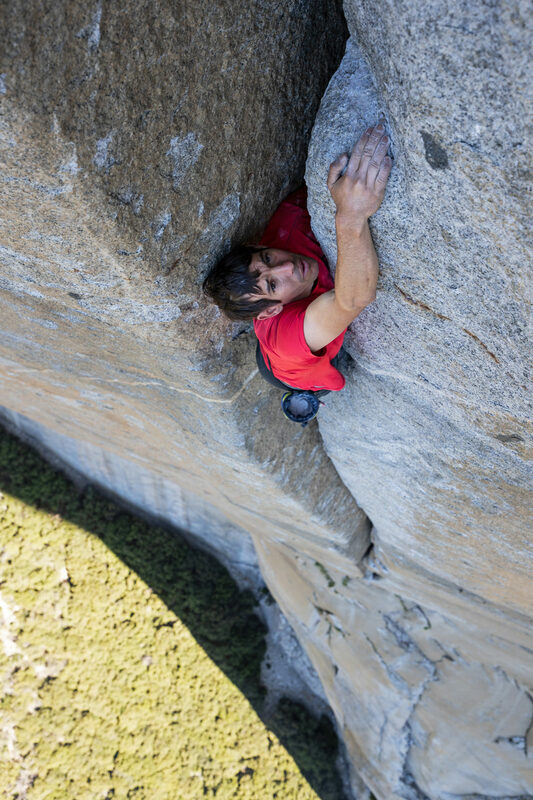 Alex Honnold: "I think it's maybe worth adding that overall, the production probably made it slightly safer for me, just because — I mean we're talking about 'Kodak courage,' in a lot of ways, I experienced the opposite. Because I was up there with my friends working on it so long, because there were people watching me, I wound up preparing more for the climb than I had maybe expected." "Free soloing is in some ways the purest way that you can rock climb." Honnold: "I mean it feels incredible. I mean, to be surrounded by air, to be in the void but still feel in control personally, to take a situation that should be terrifying but then to feel comfortable — through preparation, through hard work, through self-mastery, to some extent — I mean it feels incredible." Honnold: "On the actual day of the climb, I wasn't particularly frightened. I mean I was still certainly nervous walking up the base, because it's still a pretty intimidating wall, it's very, very large. But the thing is I was very frightened for the many years ahead of time, and that's why I put so much preparation into it, that's why it was something that I dreamt about for so long and didn't actually do it. And it wasn't until I spent two years working on it that it actually became a possibility." Chin: "There was a tremendous amount of planning and choreography in terms of shooting Alex on the wall. Over the course of two years while he's practicing, we're essentially also practicing how we're going to shoot it in preparation for the big day. So logistically, there was a lot of matters that we had to deal with: It's a 3,000-foot wall. There's certain sections that are a thousand feet down the wall, and you need to get a camera person a thousand feet down the wall. They're carrying all their camera equipment, they're building their cameras on the wall — it's a pretty significant physical task. "We also wanted to make sure that on the day of the climb, there weren't a whole lot of decisions to be made, so we practiced shooting and figured out exactly how we wanted to shoot each section that was important to the narrative. But in terms of the producing, I think that the real challenge was kind of insulating Alex from the pressures of the production." "The main question for us was whether or not us being there filming him would make it more dangerous or more likely for him to fall." Honnold: "Sanni's not going to be thrilled that that's the clip. But I mean, we had many conversations like that. I mean it's hard to — I mean the thing is, we're still dating, we're three years into this great relationship. But we were in this new relationship, and free soloing El Cap is something that I'd been dreaming about for so many years that it just meant so much more to me than a new girlfriend's opinion. But clearly that balance changes over time." Honnold: "I don't know. Honestly, El Cap has just meant so much to me for so long. It was worth it. We'll see if anything else ever captures the imagination for me in quite the same way." Chin: "There weren't, because the directive I gave to the entire team — and which I felt like I need to live up to — was that you needed to stay focused on the task at hand, and not to get distracted. That was for the wall team. It was OK for [producer Mikey Schaefer] to turn away, because he was filming on the ground." Honnold: "And in some ways, I mean Mikey had to watch the entire four hours of the ascent, whereas the crew on the wall, I would climb past them for a few minutes at a time. So they only had to be fully focused and watching the experience for a little while. But Mikey watched the whole thing. Which is why he was horrified by the end." Honnold: "I hope so. That's what I want to see." Chin: "People have asked about it. Maybe someday. Maybe someday." Emiko Tamagawa produced this interview and edited it for broadcast with Robin Young and Todd Mundt. Jack Mitchell adapted it for the web.